Graphics are a vital part of any presentation, and also have an important part to play in understanding and visualizing what’s going on in a simulation. Any Object can be assigned any bitmap (*.bmp) image. SIMUL8 is supplied with over 200 images, as well as an editor to create new, or edit existing images. To assign a new image to an object, select the object and click the graphics tab. 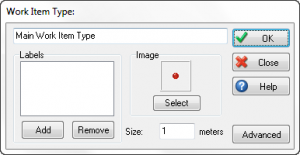 Select the Main object and select ‘More images’ to browse the image library. SIMUL8 images that are assigned to objects are saved in the simulation file, so will be automatically transported to alternate PCs. Double click on any object to open the ‘Properties’ menu and select ‘Graphics’ to edit or change an image. For the next part of this tutorial, click on Queue, and in the graphics tab on the Toolbar click image list. You will see that ‘graphic tank’ is selected. Choose Queue. This changes the on screen image into a queue of parts, so that it is visible and obvious when the queue of work items waiting grows and diminishes. Experiment with the other Queue options. The default Work Item image can be changed using the Advanced Tab and clicking on Work Item Types. If you change this image, it will change all Work Item images in the simulation. If you want your work items to look differently on leaving the simulation, or leaving an Activity, click on an Activity. In the Graphics tab on the top Toolbar, select ‘Work Item on Exit’. Activities can be animated by assigning different images to working, waiting, blocked and stopped. Just click on the Activity and select the image you want to edit in the Graphics Tab.